Nissan has just unveiled their new electric car, called the Leaf, and I think it looks perfect. One of the largest problems with electric cars is the fact that a lot of them aren't able to reach maximum speeds that other cars can, but this one will have a maximum speed of 140 kph, so no problem there. Range on a single charge is 160 km, which could be better, but this is about what you can expect from a car that is to be sold at a low price. At the moment the price is unknown, but it's supposed to be about the same as a comparable gasoline-powered car. CTV suspects it might even be as low as $15,000. The car is due to come out in late 2010 for Japan and the US, and in 2012 for global production. Given what I've seen so far this car may replace Norway's Think as my favourite...unless Think manages to step up production. For an article en français see here. The most exciting part about these low-cost electric cars is that if they manage to achieve a fair amount of popularity, they will be able to continue production and with that we will see incremental improvements in range while maintaining the same price. 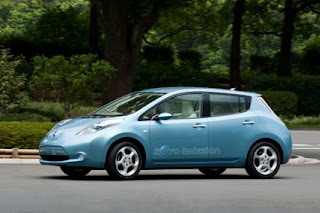 This first-generation Leaf will have a range of 160 km, but later models may reach 200 or 250, or more. Eventually the range of these cars, even the low-priced ones, will reach a range that there simply is no reason left to rely on gasoline since you have the same performance as a car, less cost and hassle in not having to fill it up, and a range that lets you make a road trip whenever you want.